From the Geoff Plumb Collection of original slides. Two Caledonian Railway engines alongside each other at Forres in the summer of 1958. On the left in steam is Pickersgill 3P 4-4-0 No. 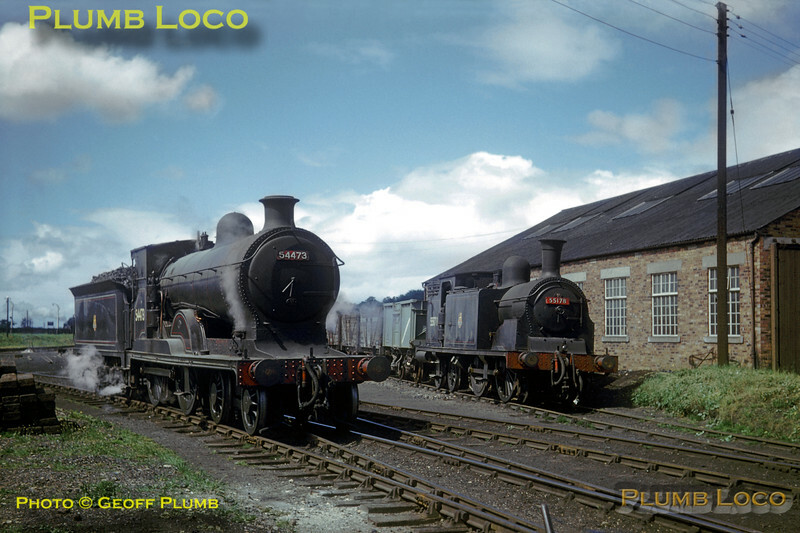 54473 class "928" introduced in 1916, while on the right is 2P 0-4-4T class "439" No. 55178, introduced by McIntosh in 1900. 54473 was built by North British, Works No. 21448 of June 1916, and was withdrawn from Corkerhill MPD in October 1959, scrapped at Connell, Union Works, Coatbridge, in February 1960. Photographer unknown, but possibly E.A.S. Cotton. Collect Slide No. 29382.